Baby's first Christmas is a wonderful time to start traditions your little one can enjoy with family year after year. From seasonal photo shoots to thoughtful gifts, this time of year is special for everyone. Keep the festive feeling by being prepared for every occasion and remember baby's needs. Holiday traditions are activities, events or special practices you repeat year after year. This is often where fond Christmas memories are made. Although your newborn or infant can recognize familiar sights and sounds, she's not likely to remember this first Christmas. Research suggests memories made in the first nine months don't become long-term memories. You can, however, capture these memories with pictures to help solidify the history of a tradition as your baby grows. Wear matching family pajamas on Christmas Eve and morning. 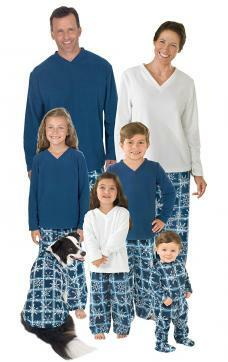 These pant and long-sleeve shirt sets are white with red trim and a red/green Christmas tree pattern. Each outfit costs just over $15 and is available sizes that range from baby up to adult men's and women's. Siblings will love a tradition that includes them, and the attire makes for a great annual photo op. Make themed salt dough ornaments each year using handprints or footprints. Use handprint impressions to make Santa Claus, a snowman family with each finger as a snowman, the Grinch or a reindeer. Use footprint impressions to make mistletoe, a snowman, a reindeer, a Christmas tree or a penguin. Choose one category, like footprint snowman, each year and have all your kids make the same kind of ornament. Since you'll choose a new theme each year, you'll have a variety of ornaments after a few years. Sing Christmas carols at bedtime instead of a typical lullaby. 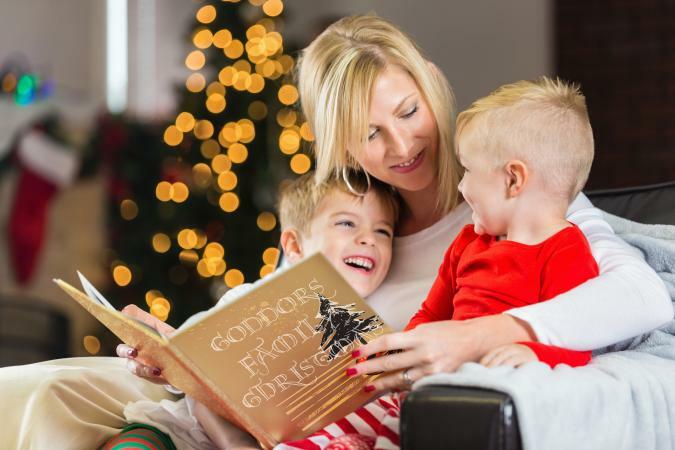 Encourage older siblings to sing carols they know to their baby brother or sister. Read a new holiday book each day for a few days before Christmas. Since baby can't select books, get the whole family involved by letting each person choose a book one day. Make a photo advent calendar. Hang a long string on the wall and attach mini clothespins. Create 25 small squares of cardstock, and number each one. Clip them to the string. Each December day, replace the number with a photo of the baby or your family as a countdown to his first Christmas. Decorate Christmas cookies. Use tools like frosting pens and markers or a plastic knife with some thick icing. Make a fun Christmas breakfast. If your little one is eating solids, let him add some diced fruit to make a mini pancake snowman. Take a Christmas light tour by driving around the neighborhood just as it gets dark. Make a fingerprint tree wall hanging you can modify every year. Purchase a picture frame and cut a piece of poster board or cardstock to fit in the frame. Use a brown marker to draw the Christmas tree trunk and tree center on the paper. 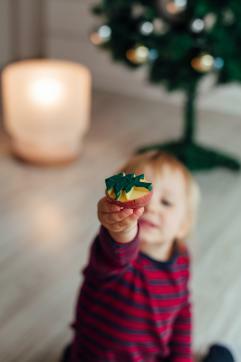 Using nontoxic yellow fingerpaint, stamp baby's handprint on top of the tree for the star. Then, use green paint to dot mom's, dad's, and baby's fingerprints around the tree center. Each year use a different shade of green to fill in the tree with more fingerprints. Hang up your creation every Christmas as a reminder how your little one has grown. Purchase an ornament that says "first Christmas" like Baby's First Christmas Personalized Wood Block Ornament. For around $43, you'll have an adorable ornament with baby's name, age, and the year. You'll always be able to pick this one out on the tree because of the unique, classic baby block shape. You'll have a memory from this year and can start the tradition of getting a new memento ornament every year. This is a great gift for grandparents to give grandchildren. Keep baby's Christmas Day outfit to use in making a Christmas quilt. Grab a box or tote bin to keep outfits year after year. When you have enough, start making a quilt or a quilted stocking from the squares of fabric. Make a mini photo book each year. After Christmas events are over, upload pictures to a site like Shutterfly where you can make a small photo book. Each year you can look through the books from the past and relive the memories. 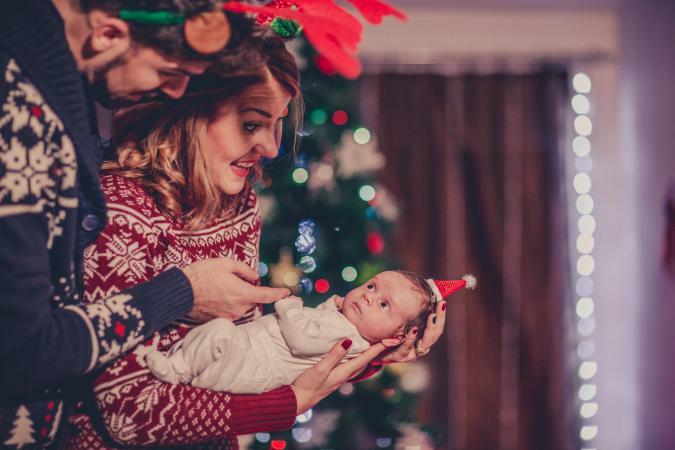 Capturing baby's reaction to this magical season in baby's first Christmas picture gives you and her something to look back on for years to come. While fancy outfits and elaborate settings look great and seem festive, they can be really uncomfortable for your little one. Consider snapping your own candid shots to serve as this year's holiday picture. Take a family photo in front of your stockings or make a set for a baby photo shoot where your little one sits inside a box that's wrapped in festive paper on the outside. Not all babies love being held by strangers, especially ones like Santa Claus who likely look very different from anyone they've seen in their everyday life. If you're after that screaming, scared baby look or another natural reaction to the big man, then go ahead and find a photo op with Santa in your town. Look for photo opportunities at new locations or smaller locations, like a church, to avoid the crowds and lines at bigger places like malls. If you'd like to capture a happy baby enjoying the festivities without the chance of her getting scared, look for places to get photos near images of a Christmas tree, reindeer, presents, or other Christmas item instead of on Santa's lap. When it comes to holiday outfits, there's no shortage of options. Elaborate outfits are adorable, but they can also make baby uncomfortable and get in the way of diaper changes and naps. Check out these cute options that will be comfortable and functional then look for similar outfits in bigger sizes for siblings to help everyone coordinate. A simple Santa Claus Bunting Costume works for boys or girls, is comfortable, and is versatile. This adorable sleeper sack is red with the look of Santa's suit built into the material in the form of a belt and white trim. For less than $15 you get the sack and a matching Santa Hat in the 0-6 month size. An outfit like this is great for layering, looks festive with one easy-to-dress piece, and won't impede baby's daily activities. Get your little guy holiday ready with an easy one-piece Reindeer Jumpsuit. This long-sleeve outfit features a red top and tan bottom half with antler and facial embellishments to look like one of Santa's reindeer. Since it's a decorated standard one-piece you'll be able to snap open the bottom for quick diaper changes and the flattened embellishments won't get in the way of your baby laying on his back or belly. For under $10 you get the jumper with a red and white striped thin knit Santa-style hat. If you want your baby to fit in with the crowd, this Faux Ugly Xmas Vest gets the job done! The long-sleeve onesie with a snap crotch is designed to look like a green collared shirt with festive red vest featuring Christmas scenes. Since the image is part of the fabric, it lies flat on the baby. Choose from the six-month or eighteen-month size for just over $10. For most kids, presents are a favorite part of Christmas. Babies, on the other hand, will either sleep through this part or enjoy playing with wrapping paper more than gifts. Since this activity is more fun for the adults giving the gifts, consider useful or thoughtful gifts for baby's first Christmas. While you might not think diapers, books, and clothes are fun for kids most babies won't discern between types of gifts, they just love seeing new things. If you do decide to purchase toys, keep holiday toy safety in mind and purchase items designed for your baby's age group. A set of wooden or plastic musical instruments including maracas will be fun for baby at any age and will last as they learn to use them in different ways. A DIY sensory bin made by filling a small bin with items like ripped strips of white paper to resemble snow then hiding in small, soft toys like felted critters and other Christmas items. Large indoor playsets are fun for older babies and continue to be a favorite toy for years to come. 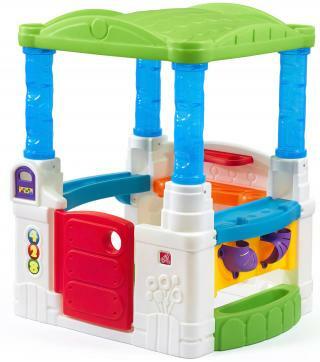 Most kids get a play kitchen or tool bench, so why not buy something more unique like the Step 2 Wonderball Fun House which features large, plastic balls like those in a ball pit and a variety of action-packed ways to use them. This small playhouse features an open top and a working door so older babies can go inside to place balls on the low counter and watch them zigzag to the floor. On the outside, there are different activity centers low to the ground where baby can place balls and watch them follow different paths as they drop. As they grow, or with help from an adult, baby can discover more exciting physics activities like watching a ball placed in the rooftop hole bounce down the side of the house through a maze of grooves. This brightly colored plastic playhouse costs about $100 and grows with the baby up through preschool years. Customers rave the play options are endless and give this play house four point seven out of five stars. Find quirky fun toys like the Tobbles Neo set take classic baby toys to the next level. This set of soft, curved, stacking pieces feel great in baby's hands or mouth and offer endless hours of creativity. For under $30 you get six stacking pieces in colors like green, pink, orange, and yellow with a blue base. Customers rave kids of all ages have fun coming up with ways to play with these versatile toys and the smart design which features a weighted piece for the bottom of the stack makes them easy for young babies to stack. Older siblings will love helping baby see all the different ways to use these. Clothing - Fun socks, cold weather accessories, and cute onesies are great. Board books - Classic made-for-baby titles include Sandra Boynton's Moo, Baa, La, La, La or Margaret Brown's Goodnight Moon. Christmas is a great time to encourage sibling bonds by allowing kids to pick out presents for each other. Babies can participate too if you get creative. Take toddlers and older kids to a cheap store like the Dollar Tree, where every item costs $1, and let them pick one or more items for each sibling depending on your budget. Talk about choosing a gift the receiver will love. Write down four or five gift options and assign each one to something baby can do. For example, you might say if baby smiles he chooses the first thing on your list and if he toots he chooses the last item. After you complete the list, whichever action baby takes first tells you his selection for each sibling. Make the selection process fun for everyone by allowing each child to pick for others using the same criteria, no matter their age. Use a classic drawing to decide which one sibling each child gets to focus on and buy gifts for. Write each child's name on a slip of paper then have everyone choose one out of a bucket. Older babies and their big brothers or sisters can all participate. Have each kid create a work of art for each other using age-appropriate techniques like finger painting for babies, marble painting for younger kids, and splatter painting for older kids. Each family is different so gift exchanges should be tailored to your family and encourage bonding. 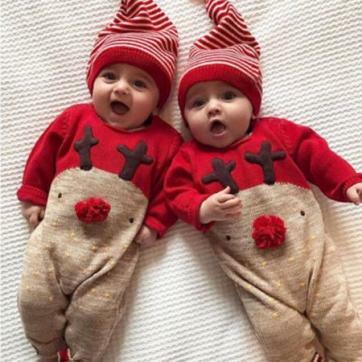 For example, Christmas gifts for newborn twins are geared toward celebrating this unique relationship. Find ways for kids of all ages to participate and make the occasion memorable. 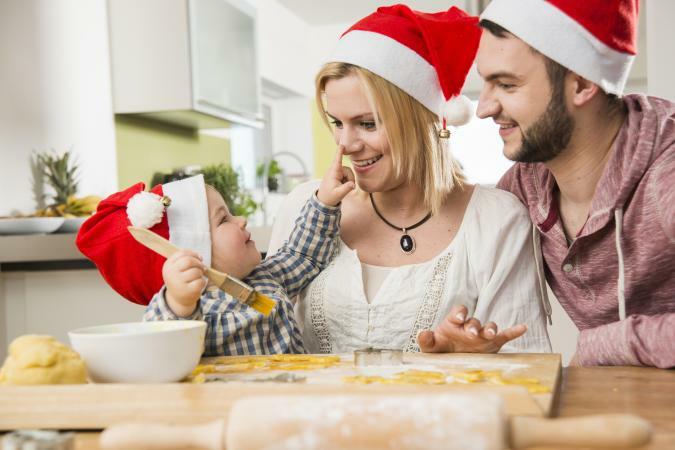 From small family gatherings to public events and large parties, Christmas is full of opportunities to show off baby or share the holiday spirit with your little one. Although you may feel tempted or pressured to do it all, keeping baby's needs as a top priority helps everyone have the best first Christmas experience. If you've got more than one child, keep everyone's needs in mind and look for opportunities to give each child an individual experience. While baby might not be ready for that after the dinner party, your elementary child would love the chance to stay up late and do something special with mom or dad while the other parent stays home. Choose only the most important events to attend this year. Spread the fun out over a few days to give everyone time with baby and keep baby from getting too far off schedule. Ask ahead about a quiet place to go at the event when you see baby needs a break. Host a holiday open house in your home during baby's peak hours. This allows friends and family to pop in and keeps baby on a schedule. Ask everyone to wear onesie pajamas to match baby's typical attire. If you can't find ways to work around baby's schedule, do your best to schedule events around sleep and feeding schedules to optimize baby's awake and happy time while with friends and family. Plan to travel during usual nap times and feed the baby before you head to the party so she'll be ready to mingle as soon as you step inside. Virtually attend holiday gatherings thanks to technology like video call services where you can leave your webcam on during party hours. This gives guests a chance to see you and baby but also allows baby the comforts of home. Depending on your location, winter weather can put a real damper on holiday travel and activities. Keep winter safety tips in mind as you leave the house with the baby. Carrying an infant and all his gear along with presents can create a dangerous scenario. Christmas decorations help create a festive holiday atmosphere, but they can also be dangerous for babies. When decorating indoors with lights follow Christmas light safety tips and check to make sure there are no frayed wires, loose bulbs, and try hanging them out of reach for baby. If using other decorations, try to keep them higher up so baby can't grab or pull them. Look for decorations that are nontoxic and shatterproof for maximum safety. Avoid any items that may fall easily, like tinsel. Buy a small tabletop tree you can keep on a high surface where baby can't reach. Use a battery-powered string of LED lights if you must have lights so there won't be a cord hanging down to an outlet. 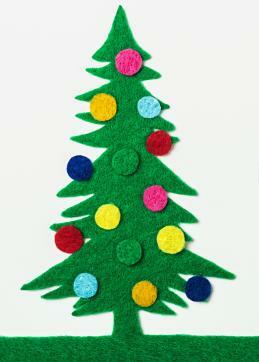 Make a felt tree by cutting a Christmas tree and ornament shapes out of felt and attaching it to a wall. Baby can safely take down and replace ornaments making it an interactive experience. Hang your tree upside-down from the ceiling so it's nowhere near the floor. Make sure any lights and other decorations don't hang down too far or are at risk of falling off the tree. Use removable hooks and green string to create a string art tree on the wall. Make sure the string is tied tight on the hooks so baby can't pull it all down. Add plush toy ornaments by tying elastic to the ornament then the string tree. This way baby can safely pull on ornaments for play. Baby's first Christmas is one of many opportunities to share traditions and capture your child's reaction to this magical time. Keep your holiday enjoyable and safe when you keep baby in mind during all of your holiday activities.